The SIP 2000 is our automatic cooler sanitizer that works with Point Of Use ("bottle-less") water coolers. Every night, usually at 2:00 AM, the SIP 2000 activates to sanitize your cooler's reservoir. 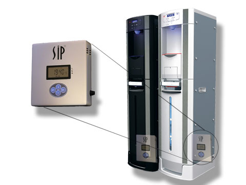 The SIP 2000 is attached inside or on the back of a water cooler. It can be purchased "pre-installed" inside of a cooler from some manufacturers. Or, you can buy the device directly from SIP and retrofit your own bottle-less coolers. The SIP 2000 is programmed to activate for 10 minutes every night. However, it is fully programmable so that you can change the time and duration of the sanitization. There are two electrical power cords attached to the SIP 2000. One 9-foot power cord plugs into the wall to supply electricity to the unit. The other receives the electrical cord from the cooler so that you only have to use one electrical outlet at your customer's location. The SIP 2000 can even control power to your cooler. So, for example, you could program the 2000 to shut off power to the cooler at 6:00 PM and then turn on at 5:00 AM. The 2000 has a bright, illuminated display making it easy to program.